North Stand, Antigua — England survived a threatening century from Denesh Ramdin to beat West Indies by 25 runs and clinch the series two-one at the Sir Vivian Richards Stadium on Wednesday. Ramdin singlehandedly inspired a fantastic lower order comeback after a typical top order batting collapse with a career best 128 that almost denied England of series glory. The Trinidadian wicketkeeper was running out of partners but kept the match alive with his superb knock in which he plundered the bowling before he was bowled; leaving the hosts 278 all out after England posted a sizable 303 for six. Joe Root struck his first ODI hundred to anchor the innings while Josh Buttler fell a run short of his maiden England century after West Indies won the toss and asked the Englishmen to bat first. Root endured the pain from an early blow on his thumb to score 107, highlighted by a 175 run partnership with Buttler while Moeen Ali contributed 55 as England secured their first limited-overs series triumph since February 2013. Root, who hit seven fours, had started his innings facing a hat-trick delivery from Dwayne Bravo after the West Indies captain had removed Michael Lumb and Ben Stokes. Bravo topped the bowling with three for 60 while there was a wicket each for Ravi Rampaul, Sunil Narine and Nikita Miller. A fashionable collapse of the West Indies top order threw the run chase into disarray as the Caribbean side was reeling at 43 for four. Kieran Powell missed a sweep and was bowled by Root for one in the first over while Dwayne Smith picked out deep square-leg against Stuart Broad’s first delivery and was caught for nine in the second over with only ten runs on the board. A 32 run stand for the third wicket between Darren Bravo and Lendl Simmons did little to bring the home side back on course. Bravo and Simmons scored 16 runs each before Ramdin arrived to play a starring role in a bid to save the day on the heels of an underperforming top order. He smashed the ball around the grounds accounting for 12 fours and five sixes and shared in several crucial partnerships that generated tensed closing moments and scary periods for England. 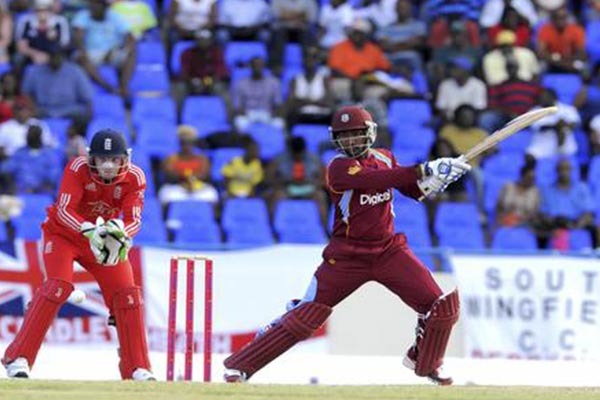 Ramdin, scored the first hundred by a West Indies keeper in one-day cricket, threatening with a 71 run stand alongside Darren Sammy, consolidating the innings on a 51 run stand with Dwayne Bravo, and inching closer to the target on an 8th wicket partnership with Nikita Miller that yielded 44 runs. Bravo scored 27, Samuels 23, while Sammy chipped in with 24. Tim Bresnan topped the bowling for England with three for 45 while Stuart Broad picked up two for 58. Root, who scored a century and took the first wicket to trigger the top order batting slide, was named man-of the match. England Innings: 303/6 (50 Overs). Joe Root 107, Jos Butler+ 99, Moeen Ali 55, Michael Lumb 20; Dwayne Bravo* 10-0-60-3, Nikita Miller 10-0-48-1, Sunil Narine 10-1-52-1, Ravi Rampaul 10-0-55-1. West Indies Innings: 278 All Out (47.4 Overs). Denesh Ramdin+ 128, Dwayne Bravo* 27, Darren Sammy 24, Marlon Samuels 23; T Bresnan 4.4-0-45-3, Stuart Broad 9-0-58-2, Moeen Ali 1-0-5-1, Ravi Bopara 3-0-18-1.